The record's out, Agents Of Absolution. It's been out for a minute now so, how does it feel to have the disc out and the fan's reception? It's great, man. We've got really good reception on the record so far. We actually sold out of the first batch of the albums. We're on backorder right now. I was amazed and it was really cool and humbling because people are being so receptive and you never know what to expect going in to something like this. You put out the music for the love of the music and to create your art and so forth and you just hope that people will like it. So, that's, kind of, what we did and we've gotten some good reception so we're real happy about that. You put out a demo just before last year's M3 Festival to get everyone in the 86 Bullets mood and a taste of what's coming up. 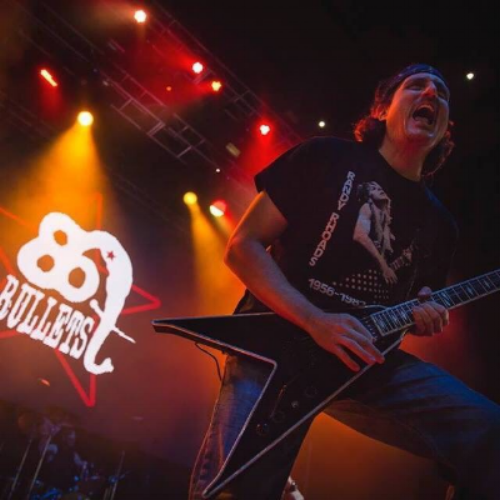 From the time you put out that demo up to the new record, how do you feel that 86 Bullets has progressed? I think, more then anything, we've had time to gel as a band and as friends really. We've gotten to know each other personally and coming into the band, not everyone had played with each other before and we didn't know each other. I was, kind of, the common thread because I had known and played with Steve (Graybeal) and Jerry (Oxendine) and Eric (Dee) in previous bands. When we got together, of course, it took some time to gel so getting another year under our belt has given us time to develop our chemistry and also write more songs and really find what our focus is. I would say that, more then anything, I think we had a good idea of what we were doing last year but now we've narrowed it down to what message we want to portray and also what kind of music works. We've learned to work together better and we know each others tendencies and strengths and that's main thing we've developed and learned over the last year. Being relatively new over the last year, how have you felt about the opportunities that have been presented to you? You played M3 last year, you played with Michael Angelo Batio and you just got done playing the Sleazy Slimey Sunday festival with the BulletBoys. How has it been for you guys with this pretty heavy upswing? It's been awesome. We've enjoyed every minute of it and we've played with some bands that we idolize and we just pinch ourselves sometimes being on the same stage because we love music first and foremost. It's in my blood, I can tell you that and it's part of my DNA. You play with some of these bands and their songs influenced your life, it's a big thing. It seems that there's a lot of bands that we've been fortunate enough to play with and connect with and that's been the most amazing part for me. The fact that when you love music and it become, more or less, a religion [Laughs] and it's an awesome feeling. It's respect and humility and everything else that comes with it and playing M3 and all these shows that we play like SSS, you do your set and we're watching these other bands and I have almost as much fun watching the other bands as I do playing because it's just great hearing these bands and the songs we all grew up with and influenced our lives. Absolutely, you've always been a music guy anyway. You and I run into each other at casual shows that you're not even playing at. Exactly and that's all part of it. I've probably seen more shows in the last twenty years then I did in the first twenty. I was fortunate enough to be pretty consistent going to shows and I've been trying to punch my bucket list out over the last fifteen or twenty. I've probably seen most of the bands that I can see, some of them aren't around anymore, they've pasted on or whatnot but it's not going to stop, man. The music that I listened to as a kid is the music that I still love today and I would have never known that when I was younger. I guess, you never think of it and I think my parents always said, "Oh, you'll grow out of the rock and roll and it's just a fad." Well, [Laughs] here we are, thirty years later and still rocking and listening to the same exact music and then some. With newer bands, I'm picky about them, if they're good, I'll like them and good musicianship will always pull me into it. I have a sweet spot, obviously, for the bands of my youth and I think that' the way a lot of us look at it and I think, especially, the M3 crowd. There's songs that are a part of our live and has affected us and you can't really get much better then that. It becomes a part of you. You and I have talked casually before about music and guitar players and you've always been open about loving a guy like Randy Rhoads. Were you able to see him when he was still alive? Yeah, that was the very first concert that I ever saw was at Merriweather (Post Pavilion) in '81. Ozzy (Osbourne) was on his Blizzard Of Ozz tour and he had Def Leppard opening up and they were on the High 'N' Dry tour and that was the first show I ever went to. It was the King Biscuit Flower Hour, they would have the live bands throughout the summer and you'd hear them on the radio and a few days before they aired the Ozzy concert from another city and that was the first time I heard Randy Rhoads live and I was completely blown away. I couldn't believe what I was hearing and I had tickets to see him in less then a week and I was just so excited for that and it left an indelible mark on my whole life. It, kind of, jumpstarted my playing the guitar and getting serious about it. Then, full circle, years later we get to play the same stage and I had to wear my Randy Rhoads tribute shirt to show respect and bring it back full circle for me from seeing my very first show there. Is there anyone out there right now that you'd like to play with and haven't? Whether that be as a guitar player or playing with 86 Bullets. Oh yeah, there's lots of them. It's hard for me to pinpoint but I can give you a few from my perspective. For me, some of my favorite current bands would be Dream Theater and Symphony X. I'm a big fan of John Petrucci and Michael Romeo of those bands. To play on a bill with them would be an unbelievable dream for me. Any band that was iconic and we grew up with would be a dream come true. Like Metallica or Megadeth but every time we get on a bill with a band that's, speaking from my perspective, part of my life, it's an unbelievable treat. Returning to the album, there's a couple of songs I'd love for you to talk about. My two favorite tracks on the record are "Stand Up And Fight" and "Live To Be Slaughtered" so I've got to ask you to talk a little bit about those two songs. Oh definitely, dude. "Stand Up And Fight" is, pretty much, a straight up rebel song. It's about being oppressed, standing up to the man, not taking it and defending yourself. We're not a violent band, we don't promote violence or anything like that, actually quite the opposite. What we are, what we do stand up for is injustice and oppression and exploitation. We believe in defending yourself if you're down then you need to speak up and do something about it, don't just sit there and take it. And, it doesn't necessarily have to be from a fighting point of view, a violent point of view, it can be verbal, it can be for leadership through skill, just to overcome what's oppressing you and what's holding you back and what's holding you down. "Live To Be Slaughtered" is a song against factory farming. It's the theme of the band. The name of the band, 86 Bullets, comes from an incident where an animal was exploited and abused. We're against that. We believe that everything has a right to its own life and a right to freedom during its life. Some of the abuses that go on at these factory farms, people need to know about it, if they don't already. It's a song that speaks to that basically the title tells you a lot right there. "Live To Be Slaughtered," your whole life is misery until you're put to death. That's something that we definitely do not condone. When it comes to your live show, you've always been heavy, guitar driven with strong vocals from Steve but you've always brought a fun side too. You're very interactive with your fans, you're very interactive with the crowd and you've got the Bullet Babes who get involved, is that something you've always wanted your show to be about? Yeah know, that's a good question, Jay. It comes from the heart. I'll just speak for myself but I can tell you that we're all this way, it's genuine. You have to like people and you have to appreciate your audience and none of that can be fake. People can sense that, when someone's fake and that will come to light very quickly. If I'm online, on social media, if someone asks me a question, I'll respond. For me, it's just simple manners and respect. The first thing is I respect everyone. I don't care who you are, where you come from, you get respect from me until you show me that I shouldn't give you respect. Everyone, to me, gets the benefit of the doubt. If I get a question, a comment or something, I'll respond to that person because that's the way I am. It's never going to change, it's always been that way and I actually feel really bad if I don't get back to somebody. That's were you have to start. You have to have that and some people don't. They just don't care and you can see that. The music comes first, obviously, if you're a great musician, you have great music then you'll get an audience, you can still be a jerk but that's not me. That's not us. We love our friends and fans and we know that we would never have any of the opportunities that we've had and I wouldn't be talking to you today without every single person out there that supports us. I love them, it's love. It's genuine and I care about them because they care about me. It's as simple as that. Absolutely, brother. So, getting into what you've got planned for this year because it's still relatively early as we get into late spring and early summer, what do you have coming up? From my understanding, your next show is at Sonoma's with Station. Is that right? Yeah, we're on the bill with Station. Dave Dillman is throwing that show, it's at Sonoma's on June 17th. We're totally looking forward to it, we're stoked. We have big respect for Station, they just got off a really successful appearance at M3 this year and I know they've got a lot of fans and they're a great band. We're happy to be on that bill with them. We know a lot of people are going to come out to support us and support them so it's going to be a great time, a great party and a great show. I'm really looking forward to it. We also have a radio appearance next Friday on Toxic Radio with Fishman. I don't know if we're playing or not. Sometimes we do an acoustic set but we might just be going up to promote some stuff and talk about the album. So, the next local show is the Sonoma's show but we're not taking on a whole lot right now in the area because we don't want to over expose and we're also working on more recordings. We've got another E.P. and it could be done today. We just got our final mixes back from Josh Clark, he records and mixes our music. He's also in another killer Baltimore band called Seventh Seal. So, we've got new music on the way and then we've got another batch so a lot of things we're trying to get done here and we're dong a music video. What song are you doing the music video for? "A Beautiful Lie." Hopefully we'll do two but we're kicking off with that one. We started filming this weekend so we'll probably need another weekend to finish up. After that I think we'll have another video and then another E.P.. So, we'll get some more songs out there for everyone. As a closer, a little teaser, since you were talking about all that new music that you have completed, can we expect the new E.P. later this year or are you going to dedicate 2017 to Agents Of Absolution? It's definitely this year. We're not looking to put it out right away. It's 99.9% finished but just released Agents so we'll sit on that for another month maybe two and then release this one and then possibly release the third one towards the fall, maybe early winter. What I'd like to do is put them all on a compilation CD and do some vinyl copies as well. If my dream comes to total fruition I also want to put it on cassette and 8-Track. [Laughs] I know vinyl is do-able so that is something that I'd be pretty happy about. 8-Tracks and cassettes might be a little more difficult. So, we're looking at least at a CD and vinyl compilation. So, it's, kind of, like a trilogy we're looking to do and that's our plan for 2017. Chris, this has been great. I hope you had a good time and thanks so much for sitting with me for a bit. Yeah, of course. Thanks, Jay.